Before work or a fun night out, isn't it great to have a place where you can get ready? 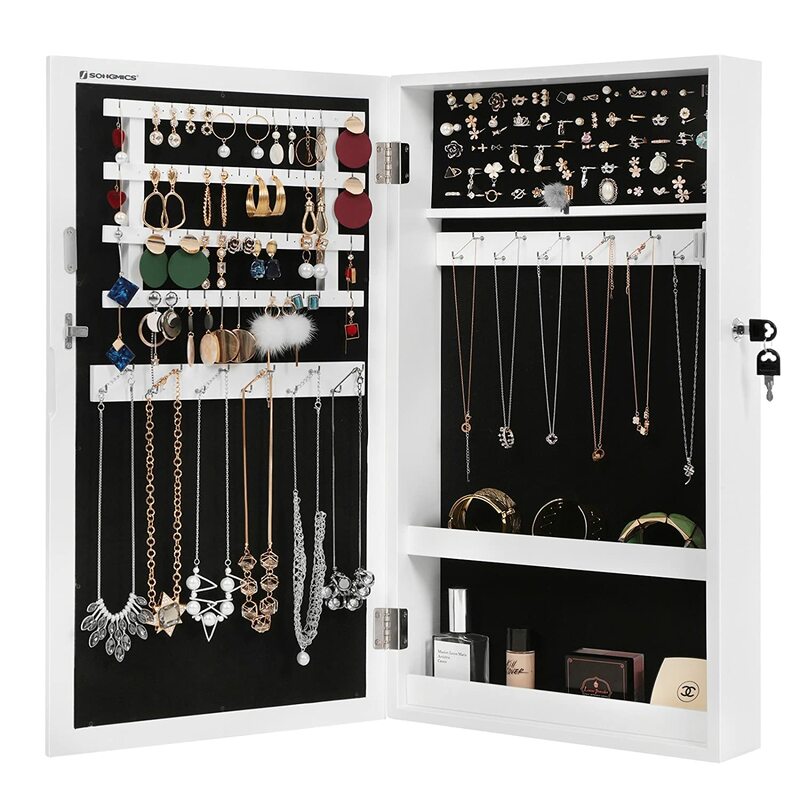 Stylish and practical, this SONGMICS jewelry armoire is perfect for you! 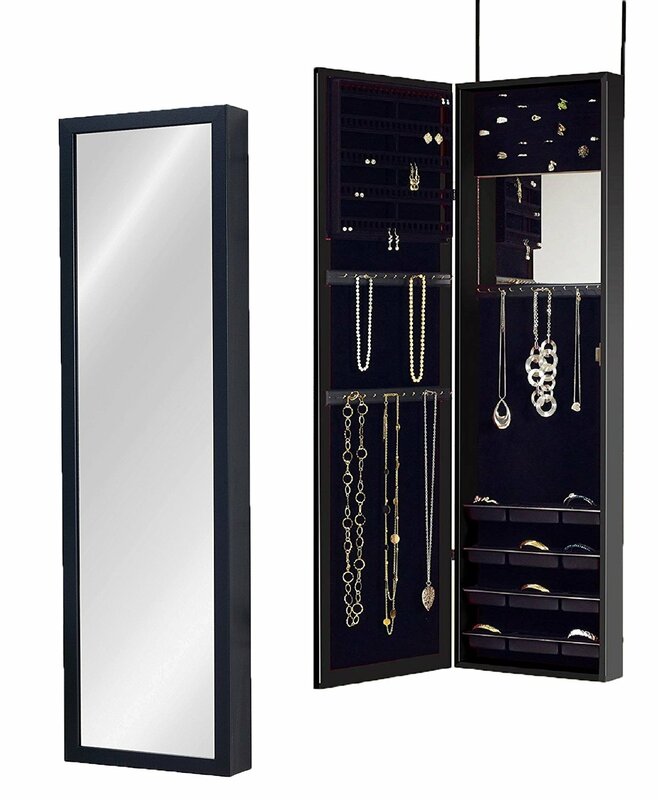 With the size of 14.6''L x 4.1''W x 26.4''H, the small jewelry cabinet takes up a little space. 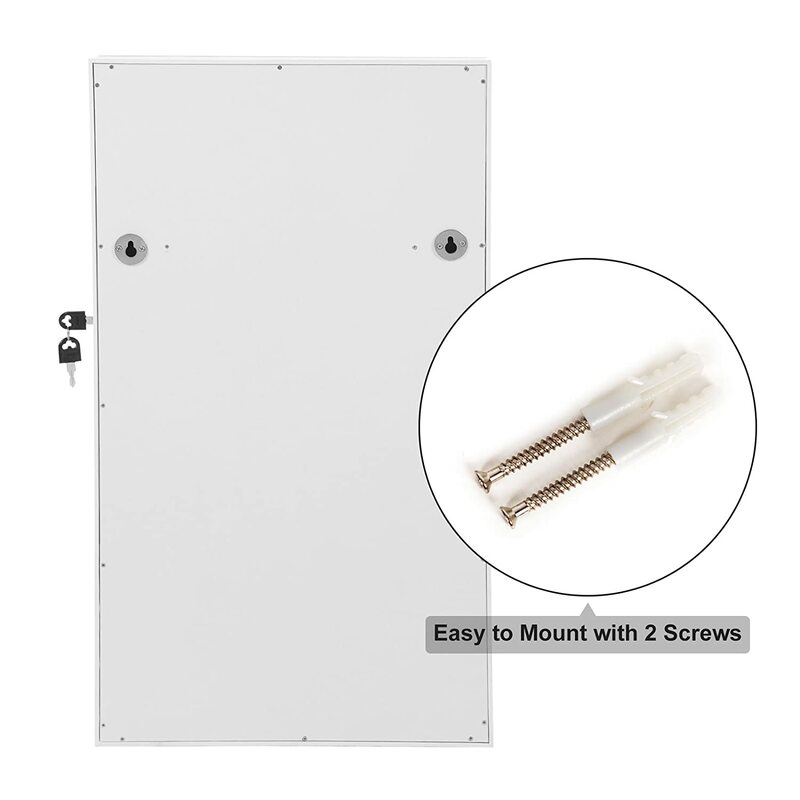 It can be mounted anywhere in your home, hallway, bathroom, and bedroom, etc. 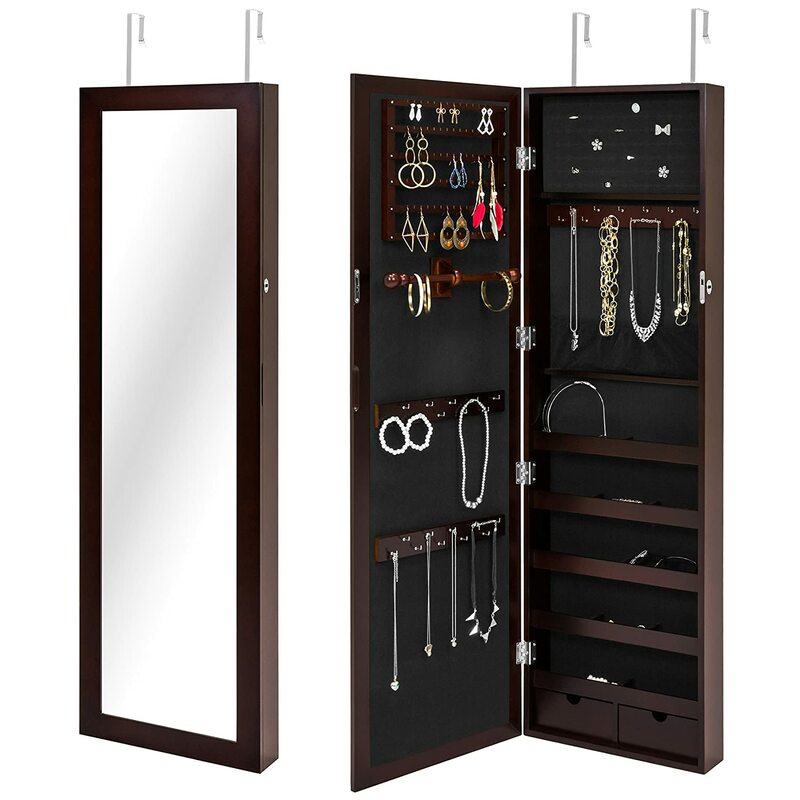 Open the mirrored door to reveal a spacious area for your gems and jewels. 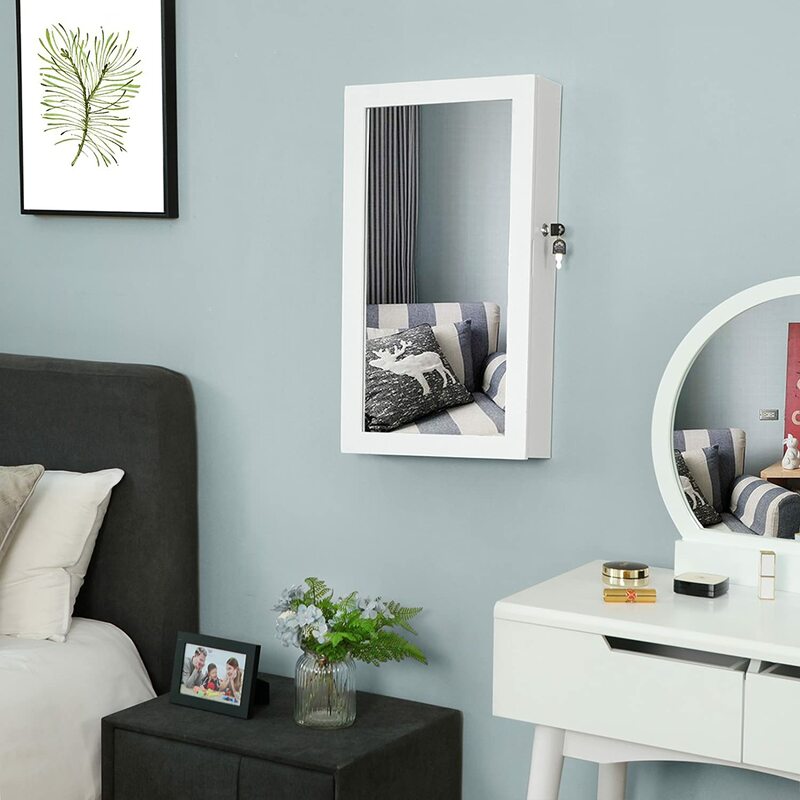 Clear partition enables you to see your frequently used items at a glance, making daily dressing up a quick process. - Please keep small parts and packaging away from children. - Children are not allowed to play under the mounted cabinet. 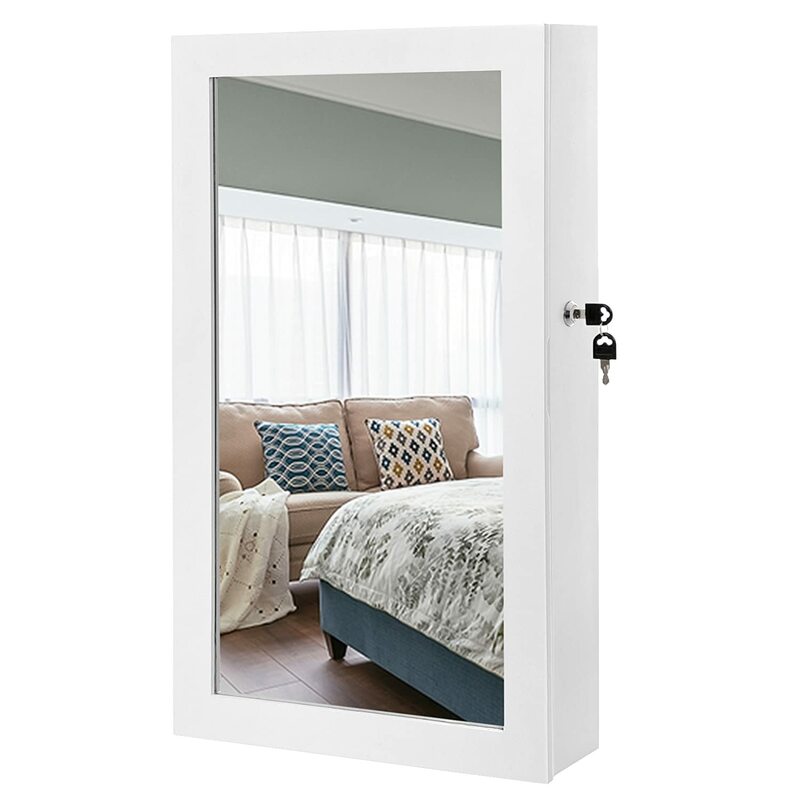 Even though it cost more to buy this smaller wall-mounted jewelry cabinet (as opposed to buying one of the many full-length mirror versions) I'm very happy I went with this item over anything else. 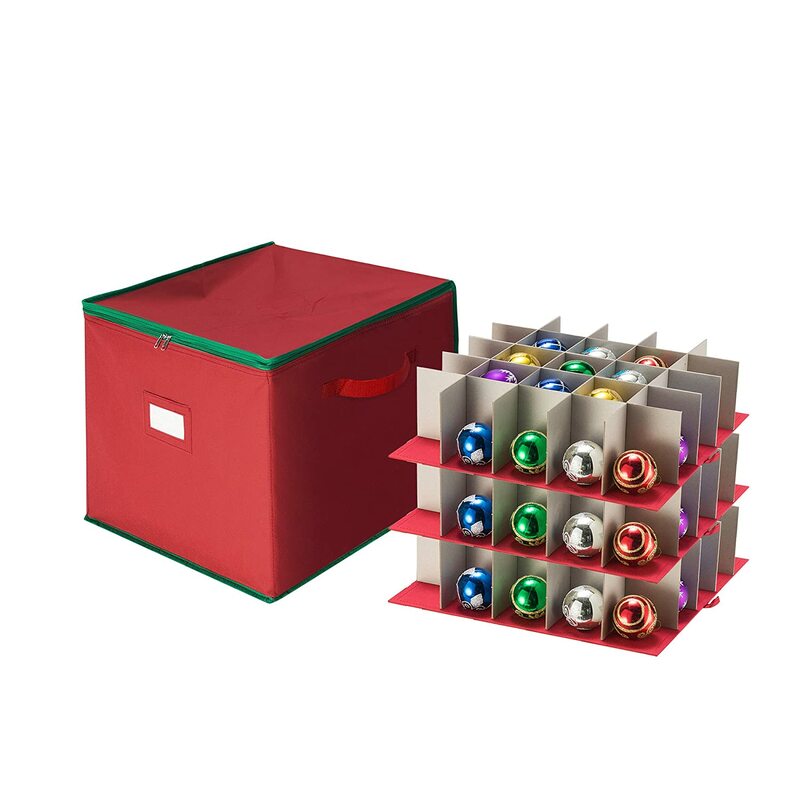 For one, it works PERFECTLY with my existing jewelry armoire. It's a fine armoire, so I didn't want to give it away or otherwise dispose of it just to save a bit of money on a wall-mounted cabinet. 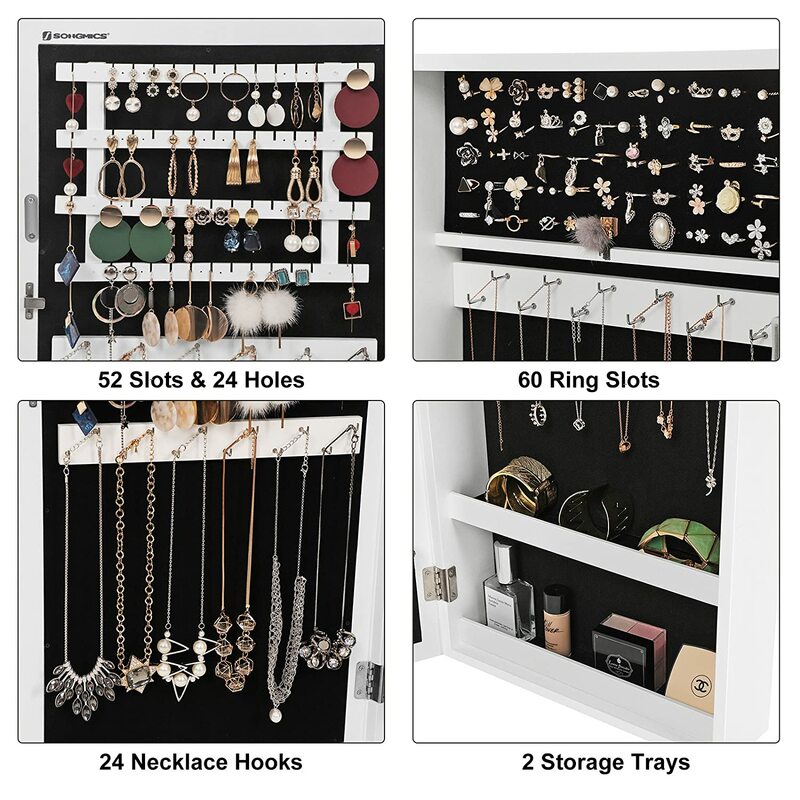 You see, what I really wanted this cabinet for was necklace and earring storage. I had been using free standing racks to hang those items but they and the jewelry on them would always get really dusty and dirty. 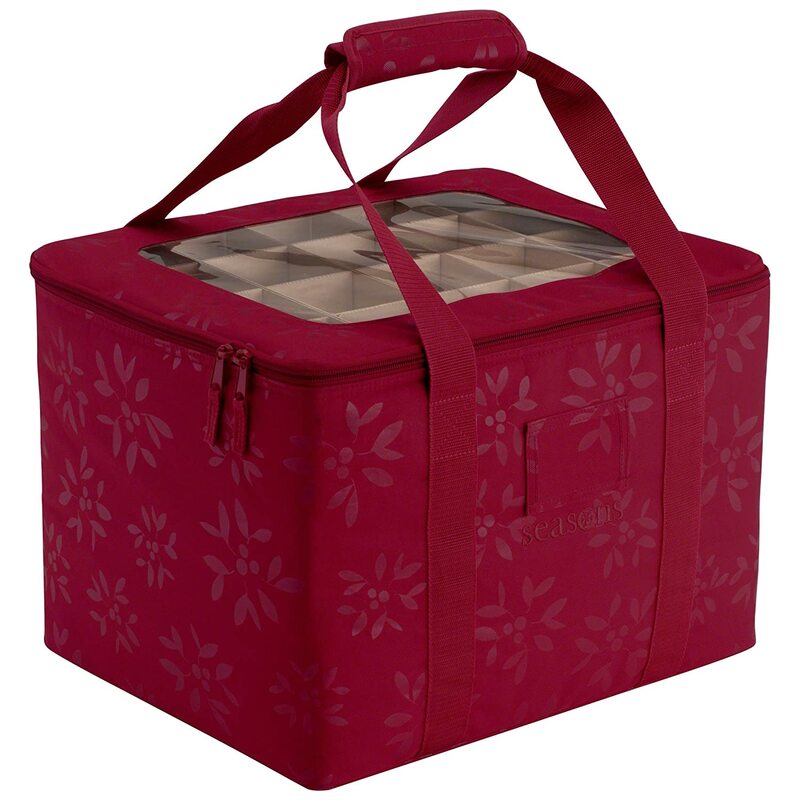 I needed a closing jewelry storage solution to protect my items from the elements. 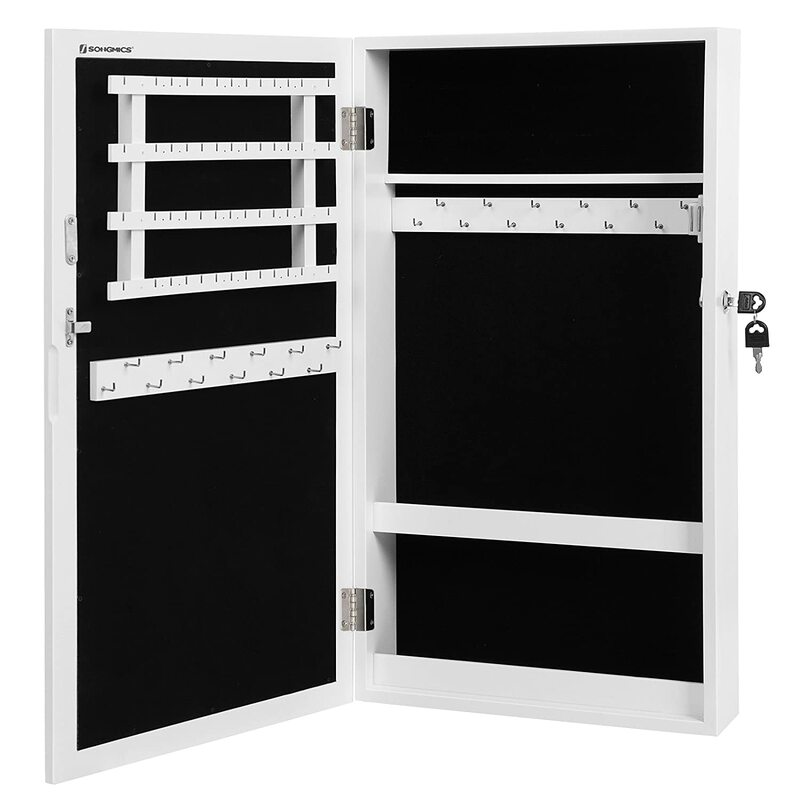 Even out of the cheaper full-length cabinets I looked at, this shorter product still had a much better interior arrangement and the most earring storage of all. I wasn't interested in the mirror at first, but now that I have the cabinet mounted, it's actually really great. I find myself putting jewelry on almost every day now, even if I won't be leaving the house, just because the mirror makes it so easy to chose and try on different pieces. 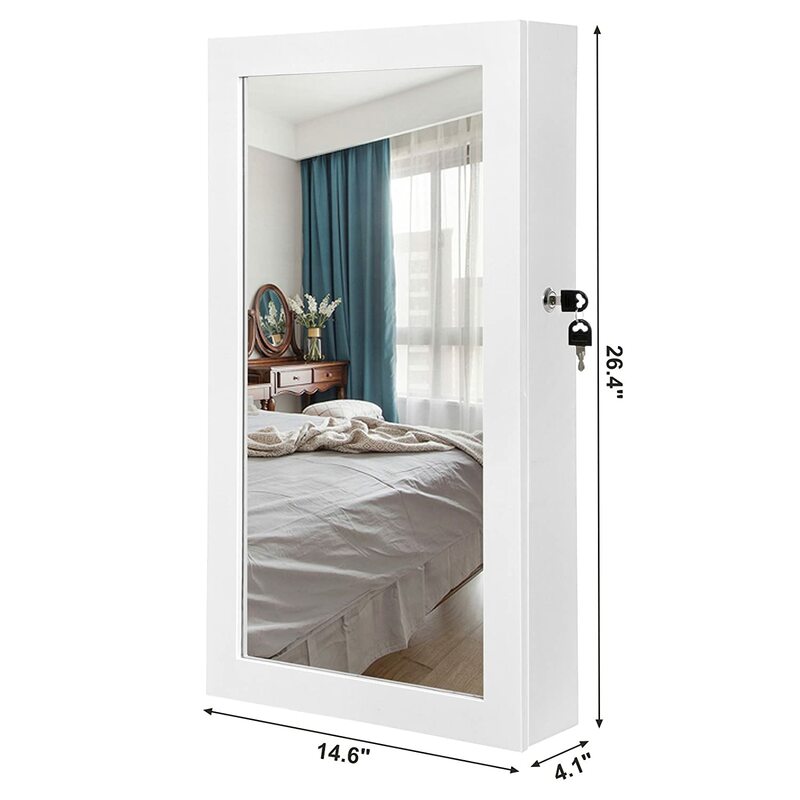 It's a good quality mirror, excellent clarity and plenty big. While I'm on the subject, all the materials that went into making this cabinet are of excellent quality and it was packaged well so that there wasn't any noticeable damage to the unit when it arrived. Now, the locking feature, though it technically works, is completely useless for me since my existing armoire doesn't lock. I just wanted to mention it so people who are actually in the market for a locking cabinet know that my unit did come with a working lock and two keys 😉 Finally, installation was pretty simple for a handyperson like myself. They included a sheet of paper that you can use to mark the anchor spots of your wall, which I was very grateful for since it reduced the amount of measuring and calculating I needed to do in order to get the cabinet mounted perfectly over my armoire. 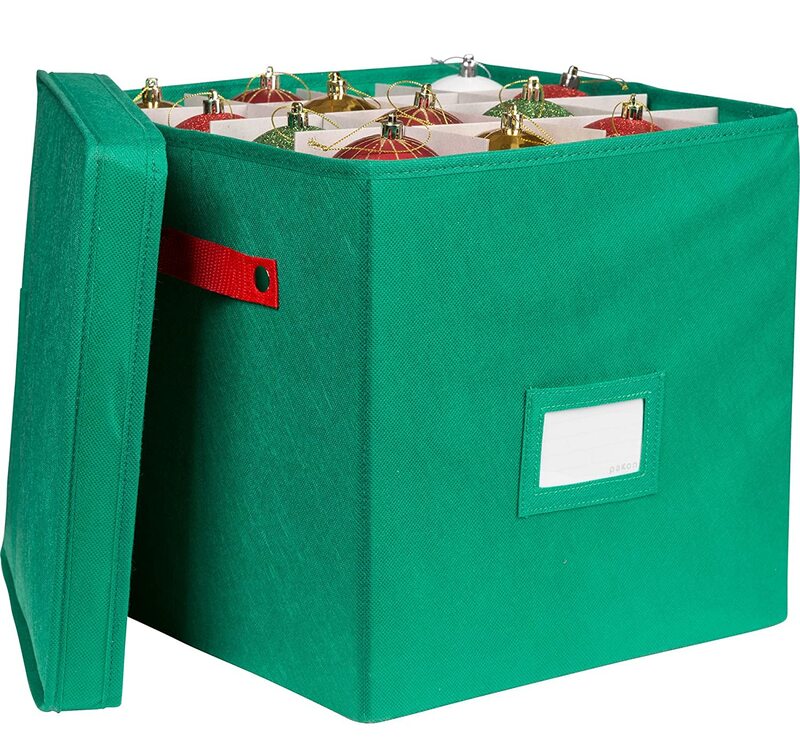 If you've never installed something like this before, you may need to seek some help for the basics, since the instructions weren't super detailed. It DID come with all the mounting hardware, so that's a plus! The only cons for this jewelry cabinet are as follows: 1) The initial factory smell was very strong. It's gone away now but if you're sensitive to that kind of thing, I recommend planning on letting the cabinet air out for a few days or even weeks (depending on your sensitivity) before actually using it. 2) The door won't stay fully open. I have gently worked it so that the hinges open much farther than they originally did, but the door still swings most of the way shut if I don't hold it. It makes selecting jewelry a little annoying but it's not enough of a hindrance to take a star off my rating. Everything else about this cabinet is so awesome that these cons would not prevent me from buying this exact same item again, if I needed to. Worked out great. Just the right size for the area I planned it for. Unit efficiently stores all my jewelry with a little space left over. I was happy to discover that the area for rings also stores stud earrings, since I'd been concerned about not being able to use that part (I don't have rings). I did find that I wasn't able to store any earrings with the backs on them, but my solution was to put all earring backs on one of the little shelves and just grab a pair when needed. This has worked out fine. In fact, it's preferable if you have more earrings than backs, as I do. Women with a large jewelry collection may want to consider the larger version of this. Love the size and all the space for my jewelry. SUPER easy to hang. Feels very sturdy. 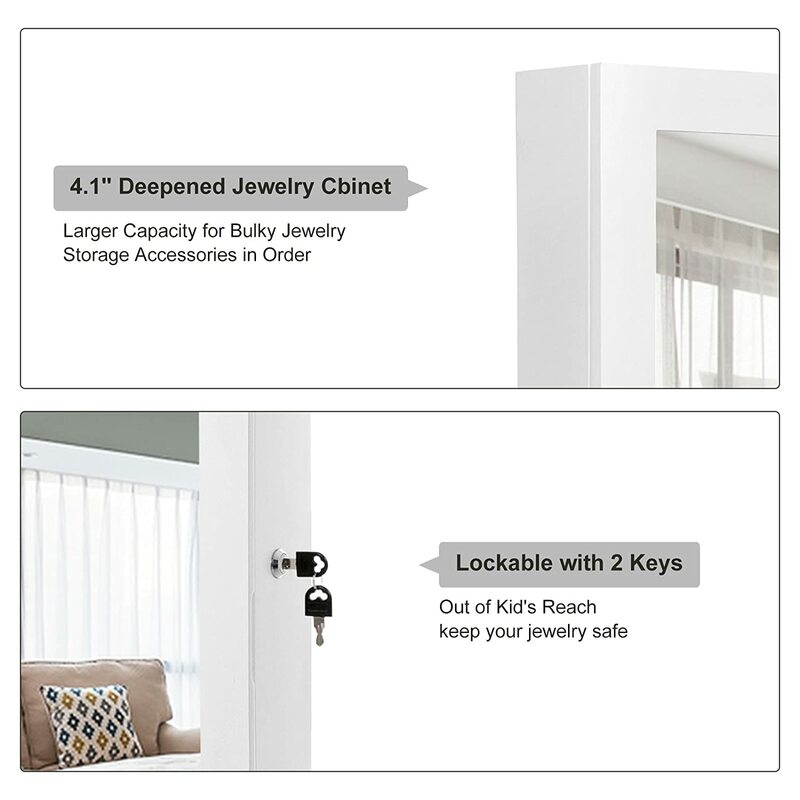 Don’t need the lock and key but it’s a nice feature. Like another reviewer said, it would have made more sense to secure it to the wall from the inside but seeing as how I don’t have too much expensive jewelry, I wouldn’t store it in something that screams “break me open” anyway. The only issues I have are that there is no space for body jewelry (belly rings and nose rings/screws) and I wish it came with a couple extra anchors. One of mine went oval when I tapped it into the wall with the hammer. 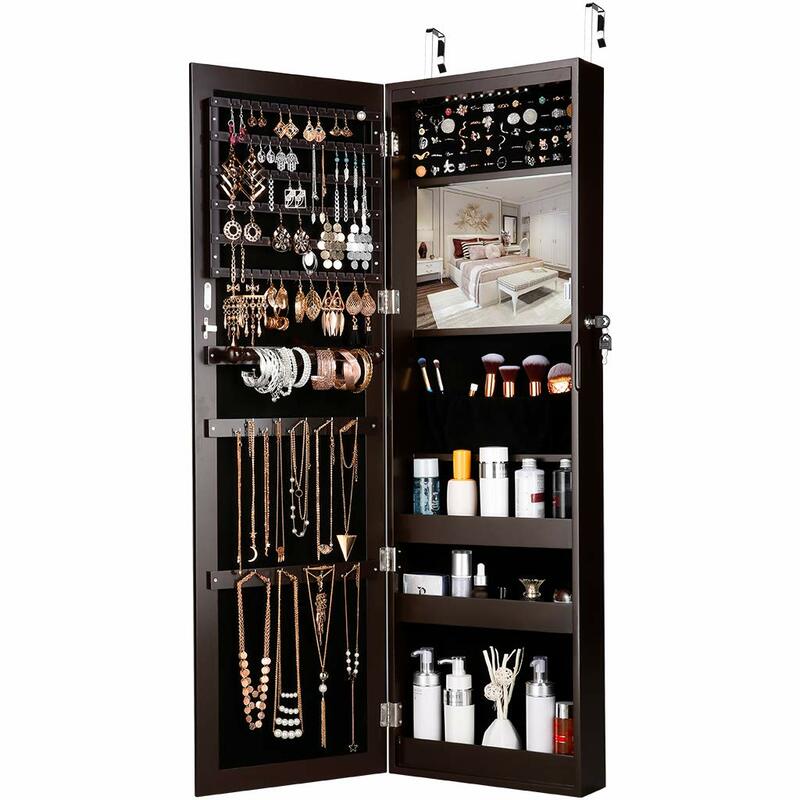 I looked and looked for a jewelry cabinet that wasn't gigantic like most, had a lock, and a large section for earrings as most smaller cabinets are lacking earring space. This is PERFECT for me! Arrived quickly and very well packaged, and came with a hanging template and 2 keys. Highly recommend! cleaning people are in the house. Met the description. Clean durable. 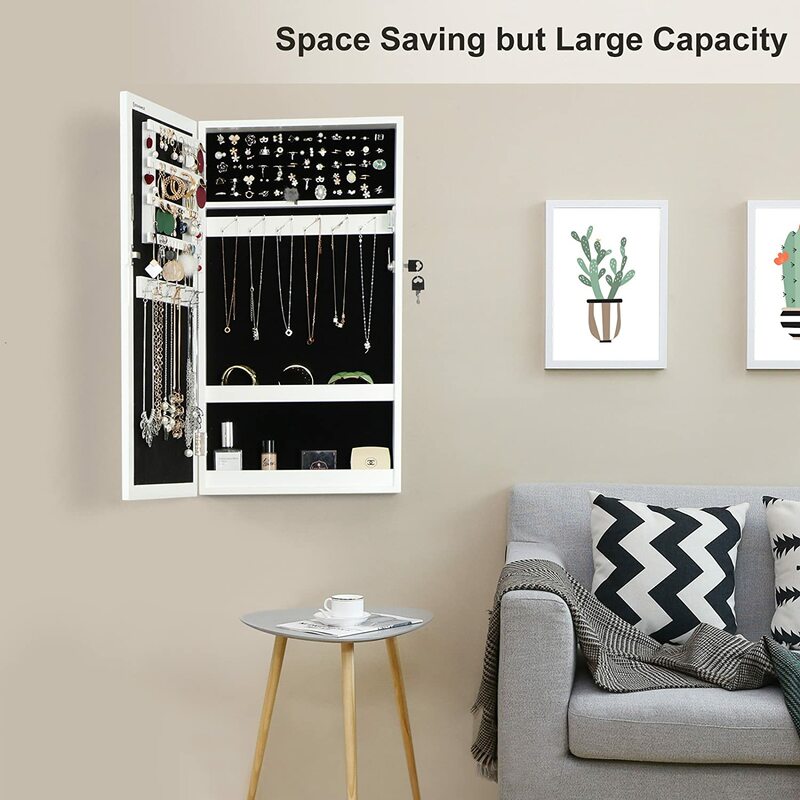 Good storage. © Copyright © 2018 www.sekkostore.com . All Rights Reserved.